I just finished the final book of Strangers in Paradise and I have to say, in light of this, Terry Moore’s Runaways is one of the single most disappointing things I have ever read; in terms of what could be expected and accomplished versus what ends up coming out. The series is the most mediocre story in a series which has been nothing short of incredible for so long, and the artwork only adds to this problem. If there was some way I could go back in time and convince people to not pick up these six issues and instead save that money to buy the first Strangers in Paradise trade, I would. So I am saying it now, if you have never read Strangers in Paradise, instead of finishing up this Runaways arc, take that money and buy the first pocket book of Strangers in Paradise and start reading that instead. This run has been average at best with only a few moments which take the series anywhere above mediocrity. Moore, for some reason, has blended a hopelessly poorly thought out plot with mediocre characterization, but the latter is the most disappointing considering characterization is one of the critical praises made about Strangers in Paradise. There’s these inconsistencies which make little sense with the characters. Probably the best example is Xavin knocking out Karolina despite their coming to agreement with a plan to rid themselves of the people from her home world coming to take her away. And the “lets body swap because Xavin’s a Skrull and can do that” plan has grown old as well. The device has been done before too many times. But for Xavin to knock Karolina out after they appear to agree on the plan anyway just points to a few things wrong with the script. First, a lack of ability to communicate what is happening in order to have melodramatic pictures of characters kissing. Second, this confusion tells me the editing is sub-par, which is evident in the speech bubbles as well. There’s a scene where Xavin says “Karolina, the Majesdanians. will not go home without you.” That’s one sentence there, divided by a random extra period. This may seem like a tiny typo, but this really shows up here as a lack of paying attention. The line was written, edited, turned into a speech balloon by a letterer and still the sentence doesn’t work. Anyway, there are some positives in this issue, mostly with the humour. The humour is funny at points, but becoming repetitive as much of Moore’s humour is relying on Xavin and Klara’s ignorance of the world they live in. One of the opening lines of the issue is “Superior technology, these Volkswagens,” which is funny, but Moore does little more than this. For the artwork being so exaggerated and silly, you’d think the script would match. But at least this plot is over and now we can get on to Moore’s final story about zombies and radio announcers, I can feel my cynicism rising up. The solicitation for the later Runaways issues really reminded me of a scene in the original Vaughan and Alphona run where the team is fighting some sort of werewolf cowboys or something and I think Gert says something to the effect of “Now they are officially out of ideas.” Too bad Runaways is getting there. Humberto Ramos’ art annoys me more than anything else, so I am very glad past penciller Takeshi Miyazawa will be back to finish Moore’s run, although Ramos will continue with the covers. But that was the only art I enjoyed in this issue. The cover was less silly then the others Ramos has done, and this series enjoyed very cool covers, almost all serious works of art within themselves. 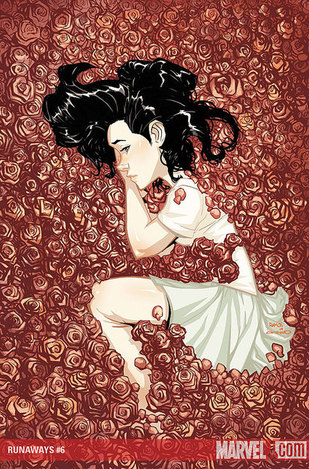 Klara covered in roses was very well done with a degree of seriousness I thought impossible with Ramos. But then I opened the comic and it’s back to normal. Ramos’ art is so melodramatic and exaggerated that I can’t engage with it. I have to say, though, I really enjoyed Christina Strain’s colouring. With the fight between the Majesdanians and the Runaways being full of bright colours, it added to the excitement of the fight. Ramos can make thing look exciting, in a way, but much is lost in an lack of believability. Also, Strain’s Karolina has a skin colour that, when contrasted with other characters, has a ethereal quality befitting her. So while the pencils are quite frustrating, the rest of the art team really attempts to pick up the slack. 4/10 Go read Strangers in Paradise, this isn’t worth the money.